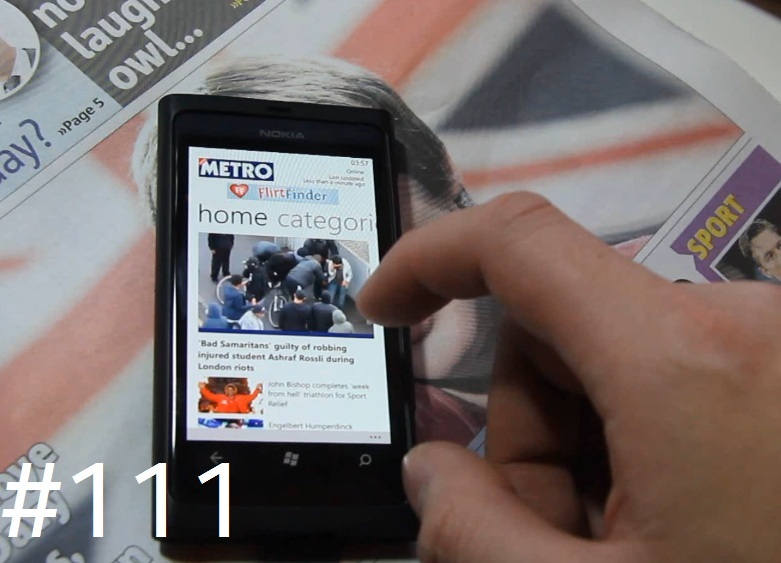 Hi folks, here’s the Metro app demoed on the Nokia Lumia 800. This Metro app has nothing to do with Windows Phone though it does utilise the panoramic UI quite well. Metro is a UK newspaper that is available for free on public transport. This is their official app (That they often demo with the 800). All info in the video. I’m surprised by the neat introduction of offline mode, so you can download the news and read them all offline. They have galleries and video option – the latter of which might be too big to download for offline. Categories can be pinned to your homescreen so you can see live tile updates on the latest news. Finally Metro, the UK’s favourite, fun, free newspaper is now live and online – 24 hours a day, seven days a week on your Windows Phone! All the latest headlines in Showbiz, News, Sport, Weird and Tech articles are at your fingertips. Culture vultures can also read up on all the latest TV, Film, Music, and Games reviews whenever and wherever they want. Facilitating the intuitive features of the Windows Phone interface the application allows you to scroll through all the top stories at a glance, from celebrity gossip to bizarre animals, or if you prefer, jump to your favourite channel and even pin category live tiles to your home screen. Keeping up with the latest news and gossip just got easier. Regular live updates keep the content fresh and, for extra convenience, content is saved in the background while you read so you can check out articles offline too. Like something? Then talk about it. Comment on articles, or share them with your friends.